During power outages, many members rely on standby generators to continue supplying electricity. It is reassuring to know that this is an option; however, for the safety of equipment and line crews, generators must be installed with a “double throw disconnect switch.” This totally isolates the standby system from the La Plata Electric Association, Inc. (LPEA) system. Opening the breakers is not adequate. Article 702 of the National Electric Code (NEC) states that “Optional standby systems are intended to protect private business or property where life safety does not depend on the performance of the system. Optional standby systems are intended to supply on-site generated power to selected loads either automatically or manually.” LPEA considers all on-site generators connected to premise wiring to be “optional standby systems” whether permanently connected or not. As stated above, a double throw disconnect switch MUST be installed. This switch will totally isolate the standby system from the LPEA system (opening breakers is not adequate). According to the NEC, “Transfer equipment shall be suitable for the intended use and so designed and installed as to prevent the inadvertent interconnection of normal and alternate sources of supply in any operation of the transfer equipment.” A qualified licensed electrician should always be used when sizing and installing any electrical equipment. The reason for the double throw switch is even a small, 120-volt generator can feed back into the LPEA system and backwards through a transformer. At the transformer, the voltage is stepped up to the primary voltage of the transformer (usually 7,200 volts). This is a very dangerous situation to personnel who may working on the power lines under the assumption that the lines are not energized. In addition to putting lives at risk, when the outage is repaired and the line crews restore the power throughout the LPEA system, it travels back to your meter. If the generator is not disconnected from the LPEA system with the double throw switch, the two sources will interconnect, causing serious damage and possible destruction of any equipment operating with standby power. If you have a generator, please complete and submit the LPEA Member Generator Form. 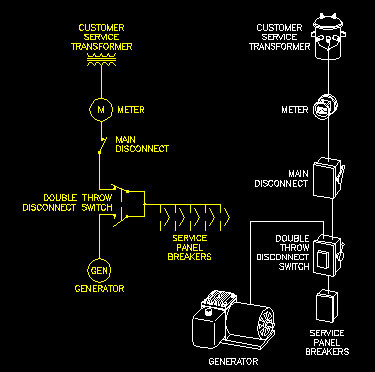 This is a drawing of an acceptable connection of a standby generator. 1. Optional standby generators must be installed with a "double throw switch"
If you have any questions call LPEA at (970) 247-5786 or your electrician.